We’re just back from a weekend in Wales where we attended the wedding of a friend of mine from school. I realised we’ve known each other for thirty years which must make me about a hundred and three. Anyway, travelling when you have a child with food allergies can be fairly daunting. This was the first time we have flown since my son was 3 months old and still dependent on me for all his sustenance. Usually we drive and self cater and I travel with the entire contents of my cupboard and a small fridge but this trip we had to pack light so I had to limit myself to snacks, safe bread rolls and a big slice of chocolate cake. We flew from Edinburgh to Bristol with Easyjet. I had a letter with me from my gp to cover the medication I was carrying (Epipens, inhalers, antihistamine) and I’d managed to procure a 35ml bottle for his antihistamine but no one paid the least attention to his bag. I had wipes to clean his table on the plane and I fantasised about having a portable mini vacuum for the crumbs (there were so many crumbs!!). We carried our own snacks and drank bottled water and the flight was uneventful apart from my daughter having dreadfully sore ears on descent wee lamb. We had decided to eat dinner in Bristol on arrival and had researched safe options on the way to the motorway before we travelled (Nandos is a family favourite) but we got lost and ended up at a motorway service station McDonalds instead. I had a gf roll in my bag so my son had a burger and fries for his dinner. We booked 2 nights at a Premier Inn next to a Brewers Fayre restaurant so I felt fairly confident about breakfasts as we have eaten with them before and always found staff to be willing to provide a freshly cooked breakfast rather than risking the terror of the buffet. He had bacon and beans. He would have had hash browns but upon reading the box which was produced for me to check I discovered they contained pea fibre. 14 allergen info is all well and good if you are only allergic to foods in the top 14! The wedding was at 2pm on Saturday so we had a picnic lunch in the hotel before we left (rolls from home with cold meat from the Asda across from the hotel, fruit and crisps) and took masses of snacks because you never know when you will get fed at a wedding and it can be a loooooong day! The wedding was at Llechwen Hall hotel near Pontyprid. 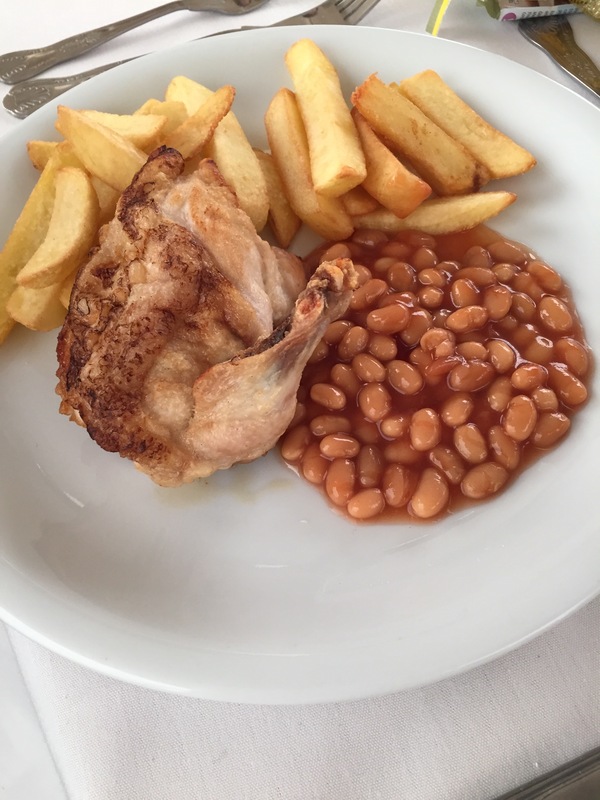 I’d been in email contact with the wedding planner to discuss a meal for my son and we’d agreed they would provide a starter of melon, grapes and apple and a main course of chicken, beans and chips (his sister was to get chicken nuggets, beans and chips so it was fairly similar). I provided pudding – a large slice of homemade chocolate cake. I had been reassured that his meal would be prepared separately and I’m delighted to report that all went smoothly. Impressive when they were feeding 70 people! The big disappointment of our trip was lunch at Bristol airport on our way home. We checked in early to give us plenty time to eat before our flight and had already decided to eat at Dexter’s bar and grill. Top tip – if you are ever looking for a meal at Bristol airport do not eat at Dexter’s. I had checked the menu online and they serve grilled meat and chips so I figured we could find something for the boy even if it was off the adult menu. I spoke to the waiter before ordering and he wrote down all the things my son cannot eat and went to check with the kitchen if the kids burger and chips minus the bun was a safe option. We were told this was a suitable meal so we ordered. When the food arrived I checked it out as I always do before we ate and was immediately concerned that the chips looked awfy crunchy in a coated with allergens kind of way so I said nobody eat yet (quite a challenge for a 7 year old boy with a plate of chips in front of him) and went to find a waiter to double check again with the kitchen. He returned with the label off the chips which clearly stated they were coated in wheat. I packed him back off to the kitchen to get the burger label while my husband nipped next door to Burger King to buy a portion of chips. The burger turned out to be ok, mostly just beef and seasoning but the chips were absolutely not ok and the waiter was unable to offer any alternative or any explanation of their royal muck up. When I explained there was a legal requirement to be able to tell me what was in their food #14allergens the waiter said but all their food contained allergens and do you know that is fine as long as you can tell me that and not serve me a meal that could cause my son harm!! Wheat might just mean my son has a sore tummy or an eczema flare up but milk or eggs or nuts would have been a very different story. You need to know what is in the food you are serving your customers! So my little man had a Dexter burger in his own roll with Burger King chips. We were not offered an apology an alternative or a discount. I am not put off travelling, as a dry run for our summer holiday it went pretty well but in future I’m sticking with Nandos!